ROCKET #1 Blasts Off For a Life of Crime This May! New York, NY—February 3rd, 2017 — It’s a dirty universe out there, even when you’re not regularly mistaken for trash-foraging vermin. And it’s about to get even dirtier. 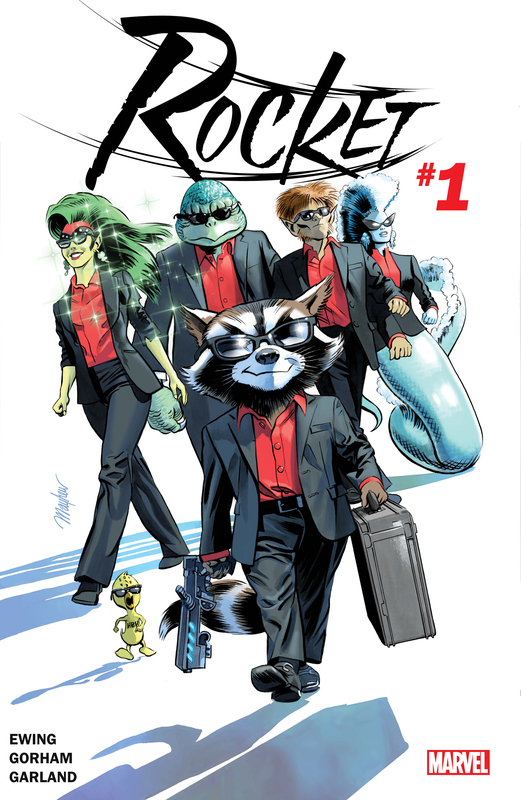 This May, Rocket Raccoon returns to the stars and returns to a life of crime in ROCKET #1! Strap in and hold on, because creators Al Ewing (The Ultimates, U.S.Avengers) and Adam Gorham (The Violent) are taking you, dear reader, on an out-of-this world caper chock full of action, aliens and all-out adventure! He thought his paws were clean, that they were on the up and up. But just when he thought he was out, they grabbed him by the fuzzy tail and pulled him back in. One day, and old flame (who happens to be an Otter) swims back into your life and just like that you’re back in the game…the heist game. From the dingy alleys of Knowhere to the far corners of deep space, they’ll speak in whispers that one of the best there ever was is back. If you need a safe cracked. If you need a vault busted. If you’ve got a big score that needs taking…you call Rocket. Just don’t call him a raccoon. It won’t end well for you. Get ready for a life of spacecrime as Rocket (and some unlikely allies) will dare any danger in the name of the next big score! Don’t miss the all-new ROCKET #1, coming to comic shops and digital devices this May!